Designing an automotive suspension system is an interesting and challenging control problem. When the suspension system is designed, a 1/4 model (one of the four wheels) is used to simplify the problem to a 1-D multiple spring-damper system. A diagram of this system is shown below. 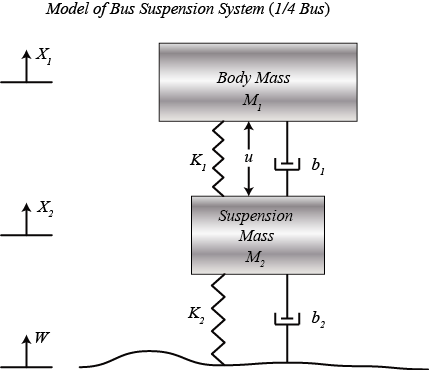 This model is for an active suspension system where an actuator is included that is able to generate the control force U to control the motion of the bus body. Assume that all of the initial conditions are zero, so that these equations represent the situation where the vehicle wheel goes up a bump. The dynamic equations above can be expressed in the form of transfer functions by taking the Laplace Transform. The specific derivation from the above equations to the transfer functions G1(s) and G2(s) is shown below where each transfer function has an output of, X1-X2, and inputs of U and W, respectively. We can generate the above transfer function models in MATLAB by entering the following commands in the MATLAB command window.